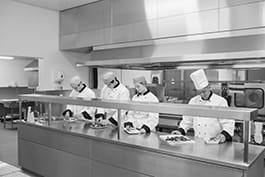 Kitchen helpers assist cooking and kitchen staff in restaurants, hotels, catering firms, canteens, etc., for example by preparing food and dishes and by cleaning the kitchen. Assist cooks in preparing food (e.g. wash and peel fruit and vegetables, cut bread and meat). Measure and mix ingredients, e.g. by using scales and measuring jugs. Prepare simple food such as sauces, dressings, sandwiches, soups, desserts, etc. Monitor supplies and inform the supervisor when more need to be ordered. Keep the work area clean (e.g. by cleaning work surfaces, kitchen equipment, cupboards and appliances). Keep the kitchen clean (e.g. by sweeping and mopping floors and removing rubbish). Rinse and wash dishes and store them appropriately (e.g. in cupboards, drawers, etc.). Trim, peel and slice products with knives, paring or food cutting tools or equipment according to guidelines. Apply food preparation techniques including the selecting, washing, cooling, peeling, marinating, preparing of dressings and cutting of ingredients. Accept the delivery of ordered kitchen supplies and make sure everything is included and in good condition. Oversee stock levels for supplies used in the kitchen. Report to the appropriate person. Disinfect kitchen equipment, utensils and other facilities such as trolleys and hot cupboards. Guarantee the continuous cleanliness of kitchen preparation, production and storage areas according to hygiene, safety and health regulations. Adhere to set portion sizes by cooking meals according to standard food portion sizes and recipe specifications. Leave the kitchen area in conditions which follow safe and secure procedures, so that it is ready for the next shift. Keep delivered kitchen supplies for future use safely and hygienically according to guidelines.